"Hubbert peak" redirects here. For the episode of The West Wing television series, see The Hubbert Peak. Choosing a particular curve determines a point of maximum production based on discovery rates, production rates and cumulative production. Early in the curve (pre-peak), the production rate increases due to the discovery rate and the addition of infrastructure. 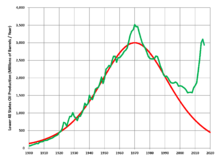 Late in the curve (post-peak), production declines because of resource depletion. "Hubbert's peak" can refer to the peaking of production of a particular area, which has now been observed for many fields and regions. Peak oil as a proper noun, or "Hubbert's peak" applied more generally, refers to a predicted event: the peak of the entire planet's oil production. After peak oil, according to the Hubbert Peak Theory, the rate of oil production on Earth would enter a terminal decline. On the basis of his theory, in a paper he presented to the American Petroleum Institute in 1956, Hubbert correctly predicted that production of oil from conventional sources would peak in the continental United States around 1965–1970. His prediction of inevitable decline has been incorrect, but the 1970 peak has yet not been surpassed. Hubbert further predicted a worldwide peak at "about half a century" from publication and approximately 12 gigabarrels (GB) a year in magnitude. In a 1976 TV interview Hubbert added that the actions of OPEC might flatten the global production curve but this would only delay the peak for perhaps 10 years. The development of new technologies has provided access to large quantities of unconventional resources, and the boost of production has largely discounted Hubbert's prediction. The standard Hubbert curve. For applications, the x and y scales are replaced by time and production scales. In 1956, Hubbert proposed that fossil fuel production in a given region over time would follow a roughly bell-shaped curve without giving a precise formula; he later used the Hubbert curve, the derivative of the logistic curve, for estimating future production using past observed discoveries. Hubbert assumed that after fossil fuel reserves (oil reserves, coal reserves, and natural gas reserves) are discovered, production at first increases approximately exponentially, as more extraction commences and more efficient facilities are installed. At some point, a peak output is reached, and production begins declining until it approximates an exponential decline. The Hubbert curve satisfies these constraints. Furthermore, it is symmetrical, with the peak of production reached when half of the fossil fuel that will ultimately be produced has been produced. It also has a single peak. The sum of multiple Hubbert curves, a technique not developed by Hubbert himself, may be used in order to model more complicated real life scenarios. For example, when new technologies like hydraulic fracturing combined with new formations that were not productive before the new technology, this can create a need for multiple curves. These technologies are limited in number, but make a big impact on production and cause a need for a new curve to be added to the old curve and the entire curve to be reworked. most likely estimate: a logistic curve with a logistic growth rate equal to 6%, an ultimate resource equal to 150 Giga-barrels (Gb) and a peak in 1965. The size of the ultimate resource was taken from a synthesis of estimates by well-known oil geologists and the US Geological Survey, which Hubbert judged to be the most likely case. upper-bound estimate: a logistic curve with a logistic growth rate equal to 6% and ultimate resource equal to 200 Giga-barrels and a peak in 1970. Hubbert's upper-bound estimate, which he regarded as optimistic, accurately predicted that US oil production would peak in 1970, although the actual peak was 17% higher than Hubbert's curve. Production declined, as Hubbert had predicted, and stayed within 10 percent of Hubbert's predicted value from 1974 through 1994; since then, actual production has been significantly greater than the Hubbert curve. The development of new technologies has provided access to large quantities of unconventional resources, and the boost of production has largely discounted Hubbert's prediction. Hubbert's 1956 production curves depended on geological estimates of ultimate recoverable oil resources, but he was dissatisfied by the uncertainty this introduced, given the various estimates ranging from 110 billion to 590 billion barrels for the US. Starting in his 1962 publication, he made his calculations, including that of ultimate recovery, based only on mathematical analysis of production rates, proved reserves, and new discoveries, independent of any geological estimates of future discoveries. He concluded that the ultimate recoverable oil resource of the contiguous 48 states was 170 billion barrels, with a production peak in 1966 or 1967. He considered that because his model incorporated past technical advances, that any future advances would occur at the same rate, and were also incorporated. Hubbert continued to defend his calculation of 170 billion barrels in his publications of 1965 and 1967, although by 1967 he had moved the peak forward slightly, to 1968 or 1969. A post-hoc analysis of peaked oil wells, fields, regions and nations found that Hubbert's model was the "most widely useful" (providing the best fit to the data), though many areas studied had a sharper "peak" than predicted. A 2007 study of oil depletion by the UK Energy Research Centre pointed out that there is no theoretical and no robust practical reason to assume that oil production will follow a logistic curve. Neither is there any reason to assume that the peak will occur when half the ultimate recoverable resource has been produced; and in fact, empirical evidence appears to contradict this idea. An analysis of a 55 post-peak countries found that the average peak was at 25 percent of the ultimate recovery. Hubbert also predicted that natural gas production would follow a logistic curve similar to that of oil. At right is his gas production curve for the United States, published in 1962. The ratio of energy extracted to the energy expended in the process is often referred to as the Energy Return on Energy Investment (EROI or EROEI). Should the EROEI drops to one, or equivalently the Net energy gain falls to zero, the oil production is no longer a net energy source. There is a difference between a barrel of oil, which is a measure of oil, and a barrel of oil equivalent (BOE), which is a measure of energy. Many sources of energy, such as fission, solar, wind, and coal, are not subject to the same near-term supply restrictions that oil is. Accordingly, even an oil source with an EROEI of 0.5 can be usefully exploited if the energy required to produce that oil comes from a cheap and plentiful energy source. Availability of cheap, but hard to transport, natural gas in some oil fields has led to using natural gas to fuel enhanced oil recovery. Similarly, natural gas in huge amounts is used to power most Athabasca tar sands plants. Cheap natural gas has also led to ethanol fuel produced with a net EROEI of less than 1, although figures in this area are controversial because methods to measure EROEI are in debate. World energy consumption & predictions, 2005–2035. Source: International Energy Outlook 2011. Our principal constraints are cultural. During the last two centuries we have known nothing but exponential growth and in parallel we have evolved what amounts to an exponential-growth culture, a culture so heavily dependent upon the continuance of exponential growth for its stability that it is incapable of reckoning with problems of non growth. Some economists describe the problem as uneconomic growth or a false economy. At the political right, Fred Ikle has warned about "conservatives addicted to the Utopia of Perpetual Growth". Brief oil interruptions in 1973 and 1979 markedly slowed—but did not stop—the growth of world GDP. Doug Reynolds predicted in 2005 that the North American peak would occur in 2007. Bentley predicted a world "decline in conventional gas production from about 2020". Although observers believe that peak coal is significantly further out than peak oil, Hubbert studied the specific example of anthracite in the US, a high grade coal, whose production peaked in the 1920s. Hubbert found that anthracite matches a curve closely. Hubbert had recoverable coal reserves worldwide at 2.500 × 1012 metric tons and peaking around 2150 (depending on usage). More recent estimates suggest an earlier peak. Coal: Resources and Future Production (PDF 630KB), published on April 5, 2007 by the Energy Watch Group (EWG), which reports to the German Parliament, found that global coal production could peak in as few as 15 years. Reporting on this, Richard Heinberg also notes that the date of peak annual energetic extraction from coal is likely to come earlier than the date of peak in quantity of coal (tons per year) extracted as the most energy-dense types of coal have been mined most extensively. A second study, The Future of Coal by B. Kavalov and S. D. Peteves of the Institute for Energy (IFE), prepared for European Commission Joint Research Centre, reaches similar conclusions and states that ""coal might not be so abundant, widely available and reliable as an energy source in the future". As of 2015, the identified resources of uranium are sufficient to provide more than 135 years of supply at the present rate of consumption. Technologies such as the thorium fuel cycle, reprocessing and fast breeders can, in theory, extend the life of uranium reserves from hundreds to thousands of years. Almost all helium on Earth is a result of radioactive decay of uranium and thorium. Helium is extracted by fractional distillation from natural gas, which contains up to 7% helium. The world's largest helium-rich natural gas fields are found in the United States, especially in the Hugoton and nearby gas fields in Kansas, Oklahoma, and Texas. The extracted helium is stored underground in the National Helium Reserve near Amarillo, Texas, the self-proclaimed "Helium Capital of the World". Helium production is expected to decline along with natural gas production in these areas. Helium, which is the second-lightest chemical element, will rise to the upper layers of Earth's atmosphere, where it can forever break free from Earth's gravitational attraction. Approximately 1,600 tons of helium are lost per year as a result of atmospheric escape mechanisms. Hubbert applied his theory to "rock containing an abnormally high concentration of a given metal" and reasoned that the peak production for metals such as copper, tin, lead, zinc and others would occur in the time frame of decades and iron in the time frame of two centuries like coal. The price of copper rose 500% between 2003 and 2007 and was attributed by some[who?] to peak copper. Copper prices later fell, along with many other commodities and stock prices, as demand shrank from fear of a global recession. Lithium availability is a concern for a fleet of Li-ion battery using cars but a paper published in 1996 estimated that world reserves are adequate for at least 50 years. A similar prediction for platinum use in fuel cells notes that the metal could be easily recycled. In 2009, Aaron Regent president of the Canadian gold giant Barrick Gold said that global output has been falling by roughly one million ounces a year since the start of the decade. The total global mine supply has dropped by 10pc as ore quality erodes, implying that the roaring bull market of the last eight years may have further to run. "There is a strong case to be made that we are already at 'peak gold'," he told The Daily Telegraph at the RBC's annual gold conference in London. "Production peaked around 2000 and it has been in decline ever since, and we forecast that decline to continue. It is increasingly difficult to find ore," he said. Ore grades have fallen from around 12 grams per tonne in 1950 to nearer 3 grams in the US, Canada, and Australia. South Africa's output has halved since peaking in 1970. Output fell a further 14 percent in South Africa in 2008 as companies were forced to dig ever deeper – at greater cost – to replace depleted reserves. World mined gold production has peaked four times since 1900: in 1912, 1940, 1971, and 2001, each peak being higher than previous peaks. The latest peak was in 2001, when production reached 2,600 metric tons, then declined for several years. Production started to increase again in 2009, spurred by high gold prices, and achieved record new highs each year in 2012, 2013, and in 2014, when production reached 2,990 tonnes. Phosphorus supplies are essential to farming and depletion of reserves is estimated at somewhere from 60 to 130 years. According to a 2008 study, the total reserves of phosphorus are estimated to be approximately 3,200 MT, with a peak production at 28 MT/year in 2034. Individual countries' supplies vary widely; without a recycling initiative America's supply is estimated around 30 years. Phosphorus supplies affect agricultural output which in turn limits alternative fuels such as biodiesel and ethanol. Its increasing price and scarcity (global price of rock phosphate rose 8-fold in the 2 years to mid 2008) could change global agricultural patterns. Lands, perceived as marginal because of remoteness, but with very high phosphorus content, such as the Gran Chaco may get more agricultural development, while other farming areas, where nutrients are a constraint, may drop below the line of profitability. Hubbert's original analysis did not apply to renewable resources. However, over-exploitation often results in a Hubbert peak nonetheless. A modified Hubbert curve applies to any resource that can be harvested faster than it can be replaced. For example, a reserve such as the Ogallala Aquifer can be mined at a rate that far exceeds replenishment. This turns much of the world's underground water and lakes into finite resources with peak usage debates similar to oil. These debates usually center around agriculture and suburban water usage but generation of electricity from nuclear energy or coal and tar sands mining mentioned above is also water resource intensive. The term fossil water is sometimes used to describe aquifers whose water is not being recharged. Fisheries: At least one researcher has attempted to perform Hubbert linearization (Hubbert curve) on the whaling industry, as well as charting the transparently dependent price of caviar on sturgeon depletion. The Atlantic northwest cod fishery was a renewable resource, but the numbers of fish taken exceeded the fish's rate of recovery. The end of the cod fishery does match the exponential drop of the Hubbert bell curve. Another example is the cod of the North Sea. Air/oxygen: Half the world's oxygen is produced by phytoplankton. The numbers of plankton have dropped by 40% since the 1950s. Economist Michael Lynch argues that the theory behind the Hubbert curve is too simplistic and relies on an overly Malthusian point of view. Lynch claims that Campbell's predictions for world oil production are strongly biased towards underestimates, and that Campbell has repeatedly pushed back the date. Leonardo Maugeri, vice president of the Italian energy company Eni, argues that nearly all of peak estimates do not take into account unconventional oil even though the availability of these resources is significant and the costs of extraction and processing, while still very high, are falling because of improved technology. He also notes that the recovery rate from existing world oil fields has increased from about 22% in 1980 to 35% today because of new technology and predicts this trend will continue. The ratio between proven oil reserves and current production has constantly improved, passing from 20 years in 1948 to 35 years in 1972 and reaching about 40 years in 2003. These improvements occurred even with low investment in new exploration and upgrading technology because of the low oil prices during the last 20 years. However, Maugeri feels that encouraging more exploration will require relatively high oil prices. Edward Luttwak, an economist and historian, claims that unrest in countries such as Russia, Iran and Iraq has led to a massive underestimate of oil reserves. The Association for the Study of Peak Oil and Gas (ASPO) responds by claiming neither Russia nor Iran are troubled by unrest currently, but Iraq is. CERA does not believe there will be an endless abundance of oil, but instead believes that global production will eventually follow an "undulating plateau" for one or more decades before declining slowly, and that production will reach 40 Mb/d by 2015. Alfred J. Cavallo, while predicting a conventional oil supply shortage by no later than 2015, does not think Hubbert's peak is the correct theory to apply to world production. Although M. King Hubbert himself made major distinctions between decline in petroleum production versus depletion (or relative lack of it) for elements such as fissionable uranium and thorium, some others have predicted peaks like peak uranium and peak phosphorus soon on the basis of published reserve figures compared to present and future production. According to some economists, though, the amount of proved reserves inventoried at a time may be considered "a poor indicator of the total future supply of a mineral resource." As some illustrations, tin, copper, iron, lead, and zinc all had both production from 1950 to 2000 and reserves in 2000 much exceed world reserves in 1950, which would be impossible except for how "proved reserves are like an inventory of cars to an auto dealer" at a time, having little relationship to the actual total affordable to extract in the future. In the example of peak phosphorus, additional concentrations exist intermediate between 71,000 Mt of identified reserves (USGS) and the approximately 30,000,000,000 Mt of other phosphorus in Earth's crust, with the average rock being 0.1% phosphorus, so showing decline in human phosphorus production will occur soon would require far more than comparing the former figure to the 190 Mt/year of phosphorus extracted in mines (2011 figure). ^ J.R. Wood. "Peak Oil: The Looming Energy Crisis". Michigan Technological University. Retrieved 2013-12-27. ^ Domm, Patti (2018-01-31). "US oil production tops 10 million barrels a day for first time since 1970". CNBC. Retrieved 2018-04-30. ^ "1976 Hubbert Clip". YouTube. Retrieved 2013-11-03. ^ Bartlett A.A 1999 ,"An Analysis of U.S. and World Oil Production Patterns Using Hubbert-Style Curves." Mathematical Geology. ^ M. King Hubbert, 1962, "Energy Resources," National Academy of Sciences, Publication 1000-D, p. 57. ^ Laherrère, J.H. (Feb 18, 2000). "The Hubbert curve : its strengths and weaknesses". dieoff.org. Retrieved September 16, 2011. ^ M. King Hubbert, 1962, "Energy Resources," National Academy of Sciences, Publication 1000-D, p. 60. ^ M. King Hubbert, "National Academy of Sciences Report on Energy Resources: reply," AAPG Bulletin, Oct. 1965, Vol. 49 No. 10 pp. 1720–27. ^ M. King Hubbert, "Degree of advancement of petroleum exploration in United States," AAPG Bulletin, Nov. 1967, Vol. 51 No. 11 pp. 2207–27. ^ Brandt, A. R. (2007). "Testing Hubbert". Energy Policy. 35 (5): 3074–88. doi:10.1016/j.enpol.2006.11.004. ^ Steve Sorrell and others, Global Oil Depletion, UK Energy Research Centre, ISBN 1-903144-03-5. ^ M. King Hubbert, 1962, "Energy Resources," National Academy of Sciences, Publication 1000-D, pp. 81–83. ^ "Exponential Growth as a Transient Phenomenon in Human History". Hubbertpeak.com. Retrieved 2013-11-03. ^ "Our Perpetual Growth Utopia". Dieoff.org. Retrieved 2013-11-03. ^ Cynic, Aaron (2003-10-02). "Eating Fossil Fuels". Energybulletin.net. Archived from the original on 2007-06-11. Retrieved 2013-11-03. ^ "The Oil Drum: Europe | Agriculture Meets Peak Oil: Soil Association Conference". Europe.theoildrum.com. Retrieved 2013-11-03. ^ White, Bill (December 17, 2005). "State's consultant says nation is primed for using Alaska gas". Anchorage Daily News. Archived from the original on February 21, 2009. ^ Bentley, R.W. (2002). "Viewpoint - Global oil & gas depletion: an overview" (PDF). Energy Policy. 30 (3): 189–205. doi:10.1016/S0301-4215(01)00144-6. ^ "Startseite" (PDF). Energy Watch Group. Archived from the original (PDF) on 2013-09-11. Retrieved 2013-11-03. ^ a b Phillips, Ari (2007-05-21). "Peak coal: sooner than you think". Energybulletin.net. Archived from the original on 2008-05-22. Retrieved 2013-11-03. ^ "Museletter". Richard Heinberg. 2009-12-01. Retrieved 2013-11-03. ^ "Coal: Bleak outlook for the black stuff", by David Strahan, New Scientist, January 19, 2008, pp. 38–41. ^ M. King Hubbert (June 1956). "Nuclear Energy And The Fossil Fuels" (PDF). Shell Development Company. Archived from the original (PDF) on 2008-05-27. Retrieved 2013-12-27. ^ a b NEA, IAEA (2016). Uranium 2016 – Resources, Production and Demand (PDF). OECD Publishing. doi:10.1787/uranium-2016-en. ISBN 978-92-64-26844-9. ^ Jones, Tony (23 November 2004). "Professor Goodstein discusses lowering oil reserves". Australian Broadcasting Corporation. Archived from the original on 2013-05-09. Retrieved 14 April 2013. ^ Kockarts, G. (1973). "Helium in the Terrestrial Atmosphere". Space Science Reviews. Space Science Reviews. 14 (6): 723ff. Bibcode:1973SSRv...14..723K. doi:10.1007/BF00224775. ^ "Earth Loses 50,000 Tonnes of Mass Every Year". SciTech Daily. ^ Daniel L. Edelstein (January 2008). "Copper" (PDF). U.S. Geological Survey, Mineral Commodity Summaries. Retrieved 2013-12-27. ^ Andrew Leonard (2006-03-02). "Peak copper?". Salon. Archived from the original on 2008-03-07. Retrieved 2008-03-23. ^ "Peak Copper Means Peak Silver". News.silverseek.com. Archived from the original on 2013-11-04. Retrieved 2013-11-03. ^ "Commodities – Demand fears hit oil, metals prices". Uk.reuters.com. 2009-01-29. Retrieved 2013-11-03. ^ "Impact of lithium abundance and cost on electric vehicle battery applications". Cat.inist.fr. Retrieved 2013-11-03. ^ "Department for Transport". Dft.gov.uk. Retrieved 2013-11-03. ^ "Barrick shuts hedge book as world gold supply runs out". Telegraph. Retrieved 2013-11-03. ^ Thomas Chaise, World gold production 2010, 13 May 2010. ^ US Geological Survey, Gold, Mineral commodity summaries, Jan. 2016. ^ Stuart White, Dana Cordell (2008). "Peak Phosphorus: the sequel to Peak Oil". Global Phosphorus Research Initiative (GPRI). Retrieved 2009-12-11. ^ Stephen M. Jasinski (January 2006). "Phosphate Rock" (PDF). U.S. Geological Survey, Mineral Commodity Summaries. Retrieved 2013-12-27. ^ Ecological Sanitation Research Programme (May 2008). "Closing the Loop on Phosphorus" (PDF). Stockholm Environment Institute. Archived from the original (PDF) on 2006-08-05. Retrieved 2013-12-27. ^ Meena Palaniappan and Peter H. Gleick (2008). "The World's Water 2008–2009, Ch 1" (PDF). Pacific Institute. Archived from the original (PDF) on 2009-03-20. Retrieved 2009-01-31. ^ "How General is the Hubbert Curve?". Aspoitalia.net. Retrieved 2013-11-03. ^ "Laherrere: Multi-Hubbert Modeling". Hubbertpeak.com. Retrieved 2013-11-03. ^ "Plankton, base of ocean food web, in big decline". NBC News. 2010-07-28. Retrieved 2013-11-03. ^ "Energyseer, Strategic Energy & Economic Research Inc., Seer". Energyseer.com. Retrieved 2013-11-03. ^ Michael C. Lynch. "The New Pessimism about Petroleum Resources: Debunking the Hubbert Model (and Hubbert Modelers)" (PDF). Strategic Energy & Economic Research, Inc. Retrieved 2013-12-27. ^ "Michael Lynch Hubbert Peak of Oil Production". Hubbertpeak.com. Retrieved 2013-11-03. ^ Campbell, CJ (2005). Oil Crisis. Brentwood, Essex, England: Multi-Science Pub. Co. p. 90. ISBN 0-906522-39-0. ^ Maugeri, L. (2004). "Oil: Never Cry Wolf—Why the Petroleum Age Is Far from over". Science. 304 (5674): 1114–15. doi:10.1126/science.1096427. PMID 15155935. ^ "Oil, Oil Everywhere". Forbes. July 24, 2006. ^ "The truth about global oil supply". Thefirstpost.co.uk. Archived from the original on 2007-09-26. Retrieved 2013-11-03. ^ "ASPO – The Association for the Study of Peak Oil and Gas". Peakoil.net. Retrieved 2013-11-03. ^ Valentine, Katie (2006-11-14). "CERA says peak oil theory is faulty". Energybulletin.net. Archived from the original on 2006-11-28. Retrieved 2013-11-03. ^ Valentine, Katie (2006-08-10). "CERA's report is over-optimistic". Energybulletin.net. Archived from the original on 2012-02-12. Retrieved 2013-11-03. ^ Valentine, Katie (2005-05-24). "Oil: Caveat empty". Energybulletin.net. Archived from the original on 2008-06-03. Retrieved 2013-11-03. ^ Whipple, Tom (2006-03-08). "Nuclear Energy and the Fossil Fuels". Energybulletin.net. Archived from the original on 2008-08-11. Retrieved 2013-11-03. ^ a b Stephen M. Jasinski (January 2012). "Phosphate Rock" (PDF). U.S. Geological Survey, Mineral Commodity Summaries. Retrieved 2013-12-27. 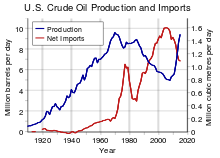 "Feature on United States oil production." (November, 2002) ASPO Newsletter #23.